On this page you'll find several sundry options. Careful copying: Activate this option if you're working with an unstable network. Additional checks are performed for the copy process and the file exists twice for a short time. This requires more space and time, but protects you against network problems. Backup on copy + delete... If you activate this option, a sub-dialog will be displayed. There you can configure if files really should be deleted, moved to the Windows paper basket (usually not available for network connections) or to a user-defined directory. Furthermore, you can configure that you want to keep older versions of files when they are overwritten. Recognize DST change: The change between daylight saving time in summer and in winter is handled differently, depending on the Windows version that you use. Due to the combination of different Windows versions in a network it can happen, that suddenly all files on one computer have aged (or become younger) by one hour. This influences the synchronization, of course. Easy2Sync can recognize and compensate this automatically. 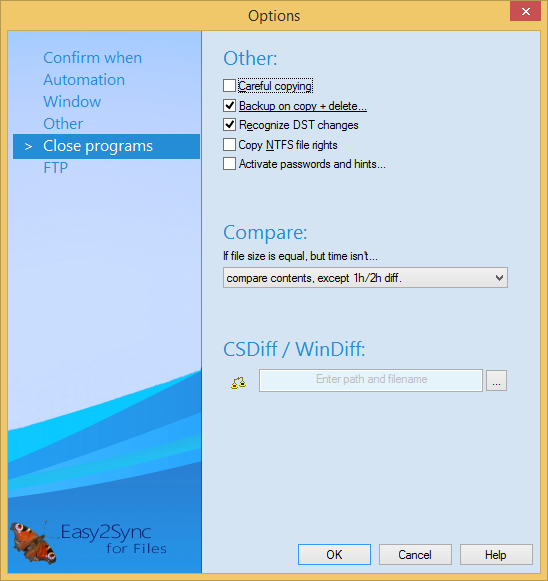 Copy NTFS file rights: Easy2Sync uses the normal Windows functions to copy a file. However, these functions do not transfer the file rights, like for example the owner. If you want Easy2Sync to transfer these rights, you just need to activate this option. Compare: If two files have the same length, but different date, they may still be identical. If you activate this option, then the file’s contents will be compared in such a case. This may reduce the number of requests, but can slow down the data collection phase. Especially for FTP-Tasks it is recommended to use this option, because otherwise there will be many requests on the first synchronization due to the different date for each file. CsDiff / WinDiff: These are external programs to compare text files. If you configure such a program here, a little button with a pair of scales (in the synchronization dialog) allows you to start the program. You can get CsDiff for free at this address: http://www.componentsoftware.com/Products/CSDiff/index.htm.